If you ever spot me at the kitchen table, pen in hand, you can be pretty sure I’m writing a shopping list. At the fold-out table in my camper van, with a spiral-bound notebook in front of me, chances are I’ll be writing a travel-inspired post for my blog to share an anecdote or observation that could only have arisen on the move. Like the time we found a dead body on holiday. Yep, fact, not fiction, folks – you can read about that incident here. Sat at my computer desk, I’ll be stoking up the blog I edit for the the Alliance of Independent Authors, or plodding through a vast action list reflecting my multi-faceted self-employed life. Least likely task of all: bookkeeping, but with the help of adrenaline triggered by Saturday’s HMRC deadline, I’ll be thundering through my tax return this week. With so much on my to-do list, I’ve realised that none of these places are very conducive to fiction writing, despite my motivational screensaver telling me to “Use your time wisely: write”. That’s a shame, because that’s what I most love to write. So today I’ve arrived at a new strategy. 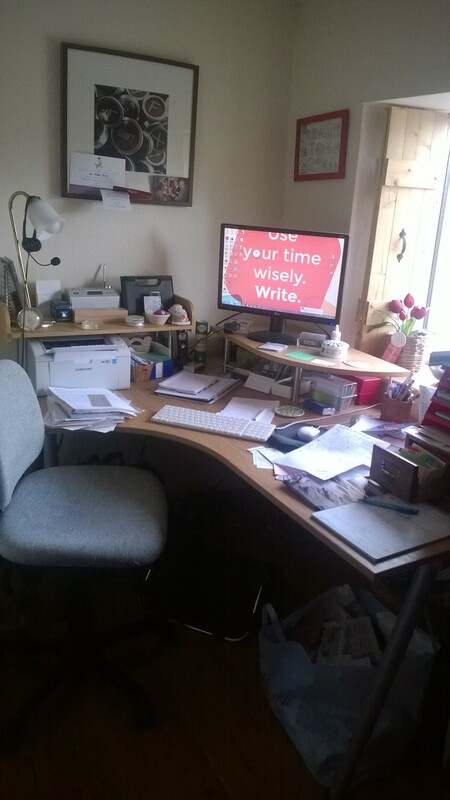 Call me Debbie Two Desks if you like, (shades of Monty Python’s wonderful Arthur Two Sheds Jackson – catch up with him on YouTube here), but I’ve just cleared my grandpa’s old bureau to create a new creative writing corner in my study. On top of the desk is the old statuette of a man reading a book, which I learned to love when it graced his mantlepiece throughout my childhood. The pull-down flap is just big enough to accomodate either an old-fashioned paper notebook, or my ancient computer netbook, which is too slow and cumbersome to tempt me to surf the net instead of writing. 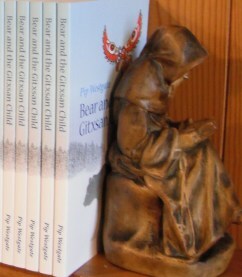 Like to know more about my little reading man statue? Find out how and why he motivates me here. I’m liking the whole ‘two desks’ idea!! My main desk is all work, work, work and I do feel the urge to find a creative place to go and write. The idea of having some sort of laptop unattached to the outside world is an excellent one too. I think some reorganisation is needed in my life Debbie 🙂 Thanks for the inspiration! It’s a pleasure, Georgia! I had in the past tried one of those programmes that stops you accessing the internet on the computer for a set time, or which records how much time you spend on different things, but the reports it gave me were just too painful to read! I know quite a few writers who opt to go to cafes or libraries to do their creative stuff, but even if I lived closer to one (nearest is 6 miles away), I think I’d find myself being distracted by people-watching. Although that would be a useful source of ideas for future stories, (I had a couple published in anthologies last year that were set in libraries, funnily enough), I don’t think I’d get much of my work in progress done! Two Desks is definitely the way to go, Debbie – I have two myself! 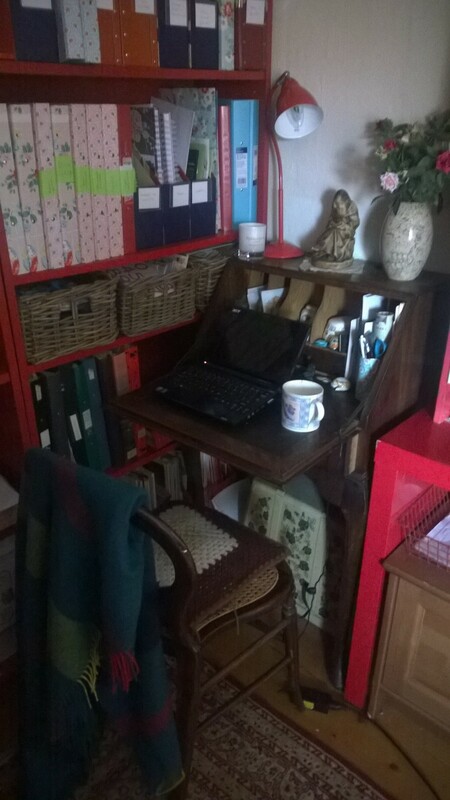 I have a proper, grown-up looking work desk (complete with filing cabinet and desk tidy – albeit an old mustard tin) for my non-fiction writing, and then an old-fashioned little school-desk (about the size of your bureau, with a sliding top that pulls back to reveal a pop-up set of alcoves for paper, etc.) for my novel-writing. I also have two computers: a whizzy laptop for work, and a plodding old heavy Macbook for novels. I find the differentiation really helps to put me in the right writing frame of mind. Do let us know how you get on with your new arrangement! Sounds lovely, Susan – I think you should share pictures of those on your blog, I’d love to see them!